The above coordinates are for St Andrews URC Church. You will need to study the Church to work out the final coordinates. The church on this site transferred from Darenth to Watling Street, Dartford, in 1910. The present Church Hall in Watling Street was built and furnished for £1250 and was opened on 12 March 1910 by Sir Henry Robson. 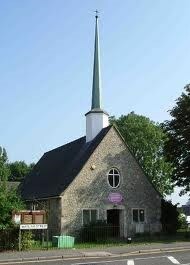 From 1910 until the building of the present church in 1961, the church served as both church and hall. The dedication to St Andrew was only adopted for the new church in October 1960. Previously the church had been known as Dartford Presbyterian Church. The United Reformed Church came into being in October 1972, bringing together the Congregational Church in England and Wales and the Presbyterian Church of England. One of the most interesting furnishings within the church is the baptismal bowl. It was once the incense bowl of a Chinese magician who was converted to Christianity. If you look at the front of the Church you will see an oval Window with A pains of glass in it. Also the front door has B panels. Cache is a black magnetic tube. Ps I had varied GPS readings but hint should lead you to the cache.